After a week in the UK, we flew back to Brindisi this morning. The temperature has risen since we left and at 5pm it’s 32 degrees. With very little wind that makes it quite warm – especially since home was 13 degrees this morning! 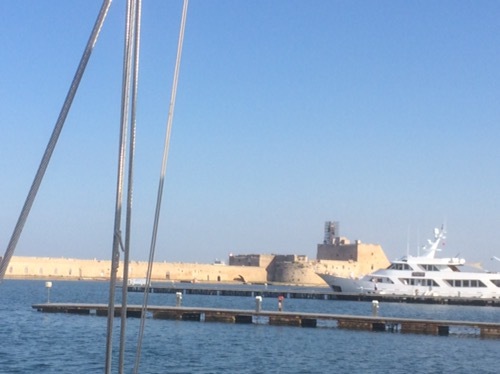 Whilst we were away, the wind was from the south and east, perfect for making our way up the coast to pick up Michael in Bari and onwards to Venice. Of course, now that we are back, the wind is going round to the NW (where we want to go) and picking up in strength so making any headway can be quite difficult. That is the sailor’s lot. I suspect that we will stay here tomorrow and sort out various bits and bobs on the boat (the list that never finishes!) and leave early on Friday morning. Off now to catch the bus into town to stock up on food (the cupboards are pretty bare) and then enjoy the sun setting somewhat earlier than the UK. This entry was posted in News and tagged 2017, Adriatic, Italy, Med. Bookmark the permalink.